"I tell you what, man, cool is cool, and wow is wow. We get so much awesome stuff in here," says Curtis Pennell, co-owner of 1BID.US, an online auction business on Bay City’s west side. We walk through the 25,000 square-foot facility, through racks, aisles, and tables filled with over eight thousand items to a 7-foot-tall black cylindrical booth. Curtis steps inside. The door closes and begins rotating around the inside of the booth. When the door opens, Curtis is gone. The door closes and rotates again...and out walks his son, Kyle Pennell. They start laughing as Curtis walks out from behind the booth. They're both cackling, and Curtis says, "I can tell you probably didn't know how this works, so we'll do it again!" "We love getting the customers with this one," says Kyle. 1BID.US operates out of a large, white cement building near the foot of the Lafayette Bridge, between Duncan's Outdoor Shop and Ideal Party Store. "They know us by middle name over at Ideal," laughs Curtis, who co-owns 1BID.US with his son, Kyle, and daughter, Kelly Betzing. Curtis is twice-retired, first working as a bricklayer for 26 years, then at General Motors for the following 30 years. 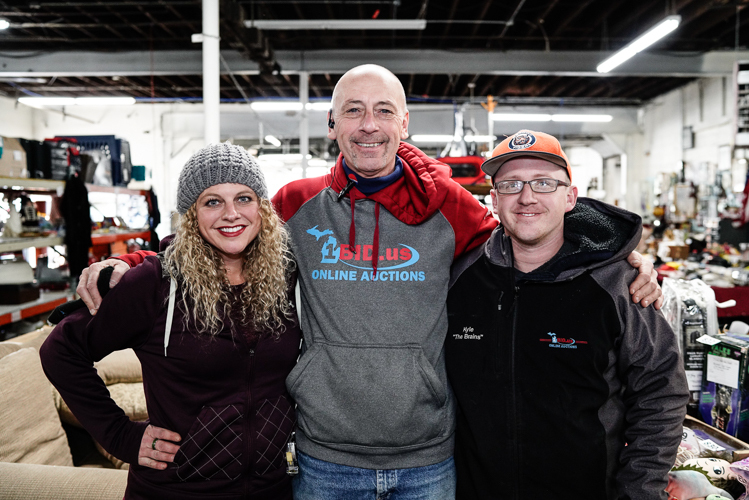 Unable to keep himself from working in retirement, Curtis opened 1BID.US with his family in 2012, working out of a small section of an old mechanics shop. Seven years later, 1BID.US is now thriving inside a 25,000 square-foot facility. "People come from as far as 90 miles to bring us things they no longer want, and we auction those things online," says Kyle. In the age of eBay, 1BID.US has managed to create a successful local alternative to the $42 billion company by providing a service that’s easier for people to use. "People don't have to worry about taking pictures, making a listing, dealing with buyers or shipping,” says Kelly. “All they do is bring us the item and describe it on a card - we take care of the rest." The process is the same for those trying to sell a single item or liquidate hundreds of items from an estate. Every week, 1BID.US hosts a new auction, running from Friday to the following Tuesday. 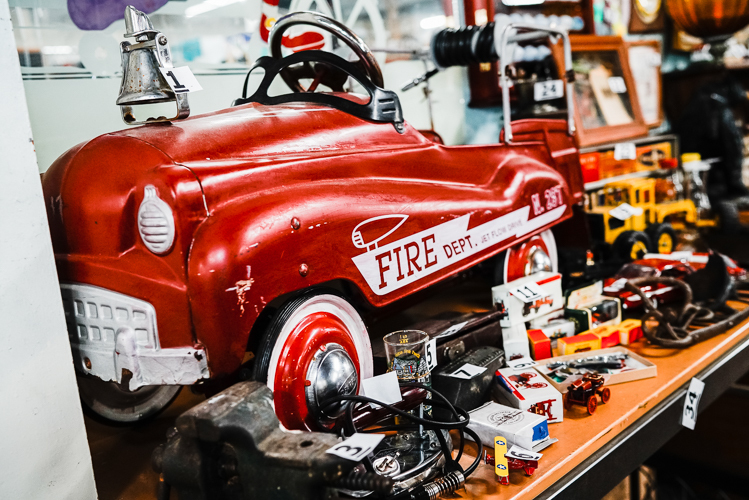 Potential buyers can view items up for auction either in the building or on the website, and visitors to the building can also preview items going up for sale during the next auction. 1BID.US takes a $2 listing fee with 20% of the final sale price, the rest goes to the consignor of the item. The winner of an item can pick it up at the building, and a member of the 1BID.US crew will locate the item and help load it if necessary. Bids can be placed online or on-site, with winning bidders picking up their items from the facility within a week. 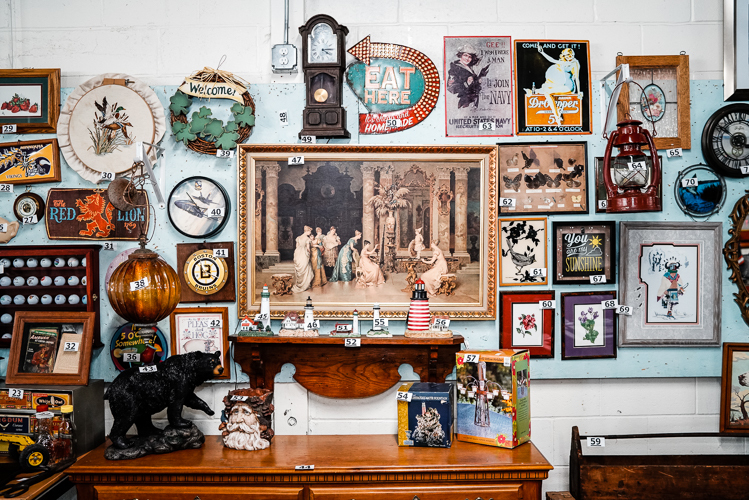 One might assume that 1BID.US serves a demographic of people uncomfortable using computers or unfamiliar with eBay, but the Pennells says that they see every kind of person from ages 18 to 80 walk through their doors to check out auction items or register on their website. The volume of items coming through building supports the claim, with the business processing around 8,000 items per week. 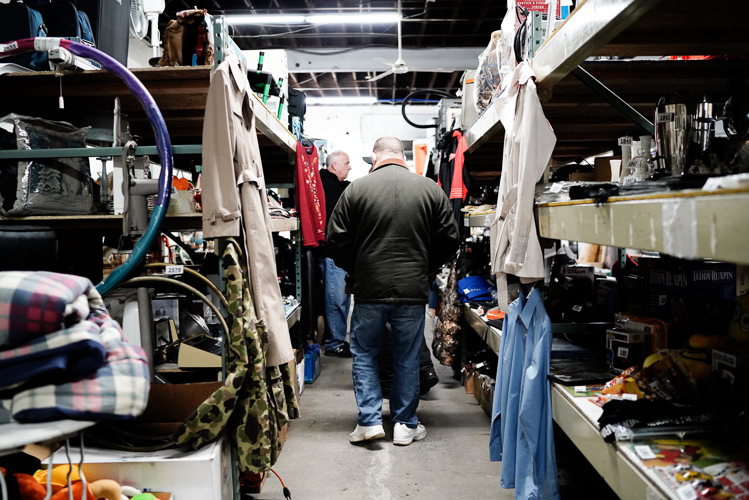 "We have about 4,000 items both come in and go out every week," says Curtis. "About 95% of the sales are done locally, the other 5% are shipped out to people who aren't local to the area." 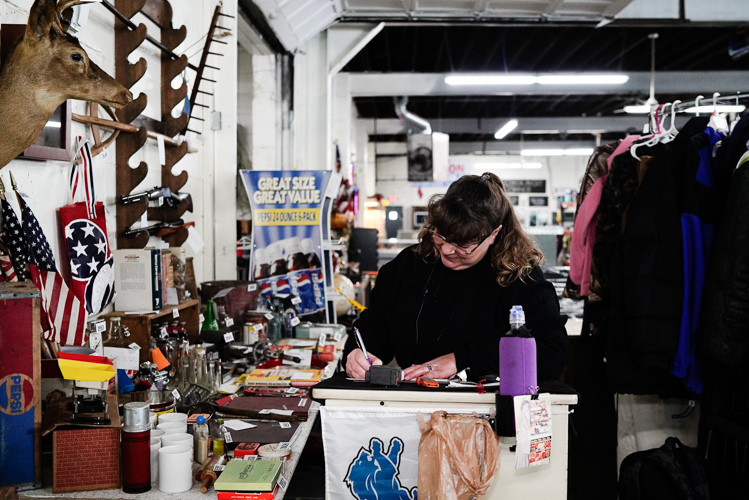 It would be easy for 8,000 items to become unmanageable, but the building is separated into three sections: items soon to be up for auction, items on auctions, and items sold at auction. “Everything is displayed, nice and neatly,” Kelley says. 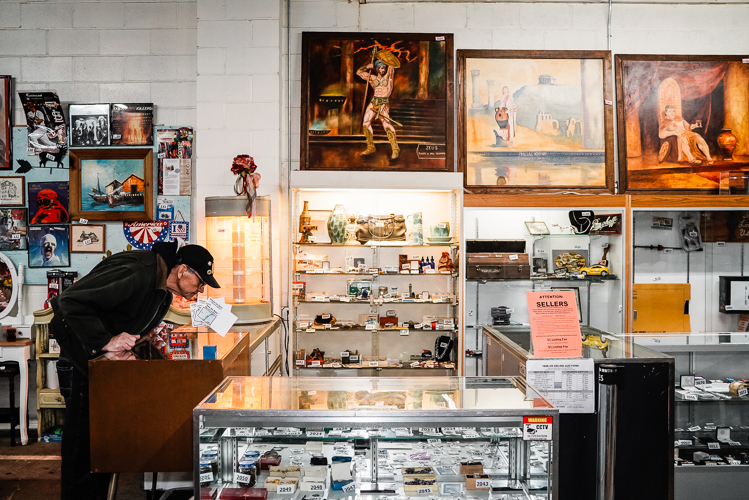 Walking through the aisles it seems less like a thrift store where people dispose of the things they no longer want and more like an antique store where items being sold have a history and story. "A lot of people come in here and it's a walk down memory lane for them," Curtis says. But this is all nostalgia, as the competition on items can be fierce--the website has 16,000 registered users, with two thousand people actively bidding during each auction. If the complexity of the operation seems like it would be a stressful one, it doesn’t show. Throughout our hour-long interview, it was hard to get a straight answer out of any of them without hacking through a joke first. When asked what it takes to run a fast-paced business like this, Curtis said, "Like I said, we go over to Ideal A LOT." When I told them I used to work out at the gym that shared the building with their original building, without missing a beat Curtis asked, "What happened to you?" The “fun and family” mentality they have towards their work and employees has rubbed off onto their customers. "One of our customers today brought us in homemade pies," Kyle says. "They'll bring us cookies, pizza, homemade bread, donuts. Almost daily!" "We have the best customers," Curtis says. "We have such a loyal customer base." Kelly credits that loyalty to the employee they hire. 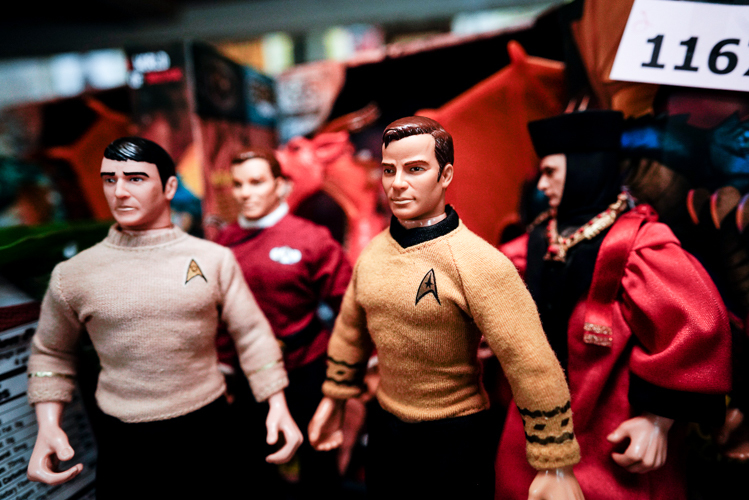 "We're not looking for people who are the most qualified. We're looking for people who are fun, have a sense of humor," she says. "They may have a criminal background and don't have a chance to get hired somewhere else. And it works - we get so many compliments on how amazing our team is." 1BID.US currently has 30 employees. "It's the only place I've ever worked where it's truly one big family,” says employee Cody Ocha. 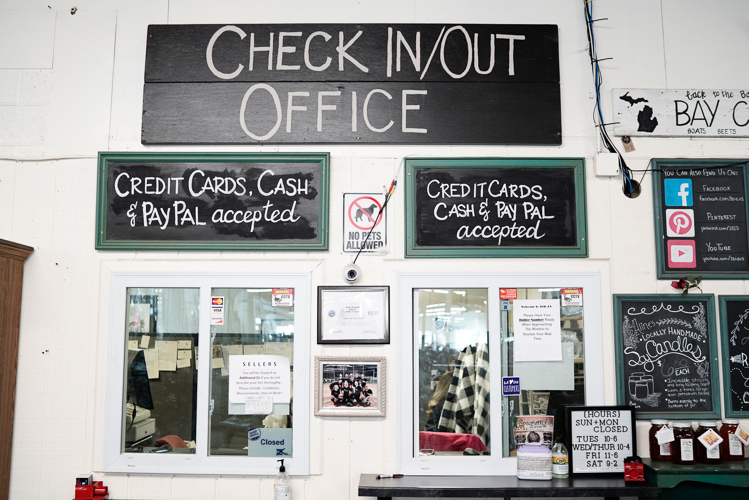 To most businesses, a 25,000 square-foot facility full of wooden pallets and trashed office furniture wouldn't seem like a perfect fit, but Curtis says it was love at first sight. "When we walked in I was like, 'Whoof, this is exactly what we need," he says. "And then the realtor told us the price, and I was in tears I was so happy. And then he says, 'You want to see the other half of the building'? And I was like, 'WHAAAT? There's another half of the building'?" While the family-owned business has expanded far beyond where they started, Curtis, Kyle, and Kelly say the next step for 1BID.US is hard to pinpoint.